Many of us have had the rich benefit of having a close, nurturing adult in our lives, but a significant number of youths in foster care do not have that privilege. Many are emancipated from foster care without a legally permanent adult connection. As a result, youths who age out of foster care without that critical support face multiple challenges and have poorer outcomes across several areas compared with their same-age peers in the general population. 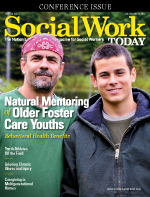 Our cover story suggests a solution borne out of A. S. Masten’s 2001 resilience theory that supports the idea that young people, including those in foster care, can experience “good outcomes in spite of serious threats to adaptations or development.” That solution is natural mentoring, growth-fostering relationships with natural mentors for adolescent youths in foster care. The term “natural mentor” refers to nonparental, caring adults whom youths select from their existing social networks, such as teachers, coaches, pastors, or relatives. The cover story says research indicates there are significant behavioral health benefits to natural mentoring in that it may reverse some of the negative outcomes for which vulnerable youths are at risk. The authors state that medical researchers have discussed the impact of natural mentoring relationships for at-risk youths from a neurobiological perspective and propose that youth resilience may be enhanced when brain pathways change over time due to repeated positive experiences within a mentee/mentor relationship. Researchers also suggest that natural mentors may serve as buffers against the development of certain mental health conditions, such as depression and anxiety, in at-risk adolescent populations. Natural mentoring appears to offer a win-win situation for youths and the culture whose challenges they must navigate once emancipated from foster care. With firm, familiar, self-selected support, former foster care youths may have a better chance of eluding behavioral health conditions and other negative social outcomes such as unemployment, underemployment, homelessness, and incarceration.